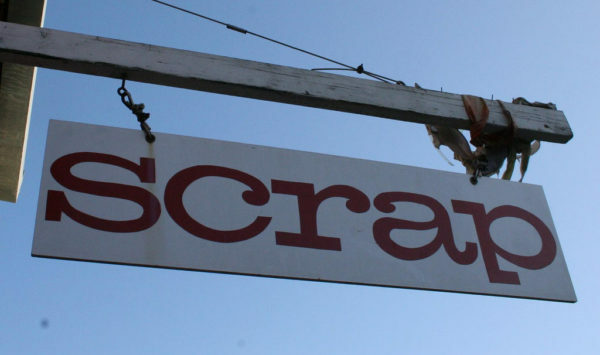 What if every school had a scrap store? I recently came across an article from The Atlantic covering the recent re-emergence of “adventure playgrounds” in the U.K. The concept, originally popularized in the 1940’s, is the direct opposite of traditional playgrounds that dot suburban neighborhoods, with their plastic equipment and piles of wood chips that encourage standard, structured play. In an adventure playground, not only is the equipment “non-traditional”, supervision is practically null. Adults are instructed to stay away, with the exception of a single adult that checks in now and then, monitoring only for activity that could lead to serious injury. The recent popularity of these once defunct playgrounds comes in response to the “helicopter-style” parenting that has become so prevalent in the last 20 years. The goal of this new type of child watering hole is to encourage creativity, as opposed to squashing it. Instead of the standard slides and swings, children build their ideal play area from garbage—things like old tires, steel drums, and discarded wood. The playground changes every day based on the children that show up, maybe a pirate ship one day and a race track the next. Not only does this type of environment unlock imagination, it teaches engineering, problem-solving, teamwork, and situation assessment. After all, with minimal adult intervention, kids have to determine what is safe and what is risky for themselves. I love this concept. I love any idea that gets kids to do what the do best—invent. Which is why I would love to see this built on with another innovative concept I also recently discovered—the scrap shop. Portland has a wonderful jewel of a store called ScrapPDX. 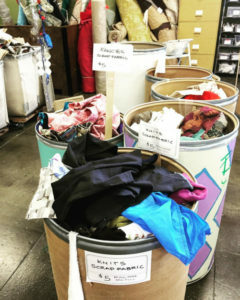 The store is similar to a Goodwill, but instead of donated, used clothes, you have barrels of worn down crayons, old silk screens, piles of glass beads, bins of half-spools of yarn, wallpaper samples, floppy disks, and more. The first time I walked in was with a friend looking for yarn. I hadn’t intended to purchase anything, but walking throughout the store, it was impossible not to see projects in every bin. A selection of random wallpaper samples that could be put into a frame to represent the shades of a wave crashing. Old America Online floppy disks made into coasters for that nostalgic programmer. The melted crayon art rainbow of Pinterest fame. You enter the store and are met with endless possibilities. What if there was one of these types of shops in every school that was open for a few hours after the end of the school day? No structured projects, or class requirements, just bins stocked full of things and a number of credits to spend. What amazing things would students create? As with every generation, there are a few monumental moments that become shared experiences among the members of that demographic—those days we all remember where we were, and what the event meant to us. For my grandparents, the crash of 1929 and Pearl Harbor; for my parents, the moon landing, Nixon’s resignation. For my generation, the “somewhere in between Gen X and Millennial”, there’s the obvious of 9/11. But not too long before that, there was something that hit even closer to home—the Columbine school shootings. I was a junior in high school the year Dylan Klebold and Eric Harris killed 15 of their classmates. I remember sitting in my co-curricular class, which combined English and History, when there was a special announcement at school. Thinking back on it now, I find it odd there would be an announcement about it. Nowadays I suppose kids would have read about it via Twitter or Facebook, but in 1999 the majority of us didn’t have cell phones. I recall whoever read the announcement mentioning counselors were available if any students wanted to talk about the events, but not much else. I went home, and promptly took to Google (which I had only just heard of four months earlier), reading what I could about the event. There was a lot of discussion about the school and the community that surrounded it. I remember people saying it was such an odd place for a shooting—an upper middle class neighborhood with a low crime rate. I remember people saying it resembled my community, my school. Unlike 9/11, Columbine isn’t something I regularly discuss with my peers. Every once in a while, we’ll chat about where we were when the towers fell, but rarely (if ever), do we share how Columbine affected our teenage lives. But it did. 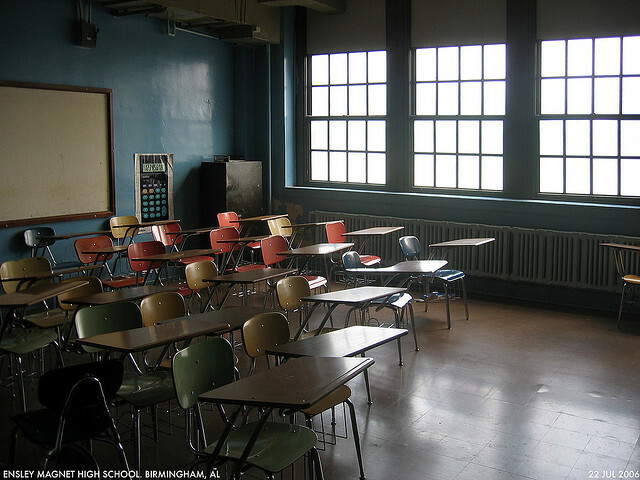 Before Columbine, there were no school assemblies about bullying, or mental illness among students. Zero tolerance polices only started popping up after Columbine. Being different, or being goth, wasn’t something to be feared. Just like 9/11, the year after Columbine brought a great deal of small, but significant changes into my life. Though I’ve read several books on Columbine since, it wasn’t until today that I really had an opportunity to reflect and explore the events of that day. This afternoon, I attended the Oregon Children’s Theatre’s performance of “Columbinus“, a play exploring the issues of alienation, hostility and social pressure in high schools through the events at Columbine. First of all, I’d like to commend the theatre on the grace with which they are handling this sensitive subject. The play is quite racy, quoting excerpts from Klebold’s and Harris’ writings, as well as playing an actual 9-1-1 call received from a teacher as the shooting was happening. It’s also not easy to watch teenagers shout profanities, racial slurs, and make explicit sexual comments (though I’m sure this happens every day in schools). The theatre is quite aware of this, and provides a warning on their website, resources for grief and trauma counseling, and has the assistant stage manager lead an interactive exercise about the play’s content and themes, inviting the audience to submit questions, at the end of the show. 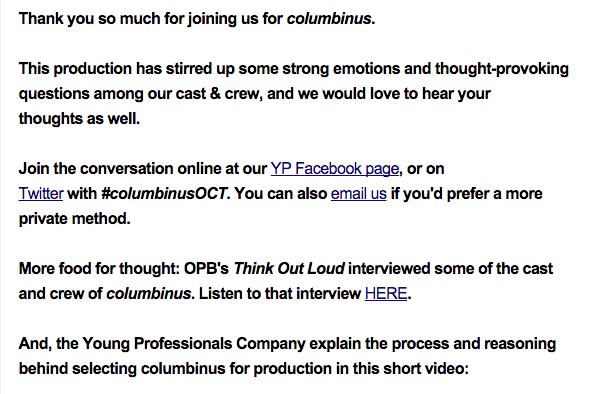 Lastly, I received the following email, inviting me to even more outlets where I could talk about the play’s impact. I love that they are inviting a conversation because, let me tell you, you feel it. 16 years later, my heart still raced as the actors packed backpacks with fake pipe bombs. I cringed every time the actors banged on a box to represent a gun shot. I nodded my head as the actors portraying Klebold and Harris ranted about how the media would try to blame it on violent video games and movies, without acknowledging the painful reality high school can be for some kids. It was a bit surreal how the play intertwined past and present together, allowing hindsight to mix with pre-Columbine innocence. The strangest part, however, was to sit in a theater with a whole bunch of high schoolers where shootings are now just the reality of life. Columbine was not the first school shooting, but it’s the one that launched the modern day debate over the conditions in schools. It’s the one that dramatically increased school security policies. And it’s the one that launched a culture of being different becoming a reason to be suspected. There are now more years between me and high school than there are between my being born and freshmen year, so some things are starting to get hazy. But Columbine will always stay with me, and I’m glad this play may help future generations deal with the tough questions the aftermath of that event continues to pose. This weekend, I happened upon this gem of a video clip, starring Kirsten Dunst. I studied aboard in London during the summer of 2004. Being a major hub for Europe, most major films would hold premieres in Piccadilly Square, not far from where I lived. My fellow students and I would head straight from our internships to the big theaters, pushing to get spots along the barriers so we could see our favorite stars. It was a good summer for movies. Spiderman 2 was released, as was King Arthur—all starring some of my favorite actors at the time (including Kirsten Dunst). This was a time before smartphones, before unlimited data and texting. None of my fellow American students had brought cellphones with them. We relied on good old meet-up spots and watches to coordinate activities, and actual cameras to take photos. At the time, we attended these premieres not to be seen, but to see. I can still remember the rush of excitement from standing less than a foot away from Kiera Knightly, and the blush upon my cheeks as Tobey Maguire smiled at my loudly yelling friend. My friends and I weren’t the autograph types—we were logistic hounds, curious more about the hum and whir of the Hollywood machine behind closed doors, and what these celebrities were like when the cameras weren’t around. Now we live in the age of the selfie. As shown by Kirsten Dunst’s short clip, our culture is more about being seen than seeing. Celebrity interactions aren’t moments of fan fare, more opportunities to display your own awesomeness. “Look at my fantastic, exciting life—aren’t you jealous?” We don’t witness celebrity…we harvest it. But it goes beyond these rare moments of running across a celebrity and snapping a selfie. This type of mentality pervades my Facebook feed everyday. Pictures of elaborate restaurant dinners, selfies of drinking coffee in workout clothes, shot after shot of folks on hiking trails (but not the trails themselves). My husband and I are notorious for our rampant couple selfies, to the point a friend asked us to take more pictures of what we were doing instead of each other on a recent vacation. I’m not saying it’s wrong to want to chronicle the special moments in your life. Without these pictures, I wouldn’t feel connected to my RV-ing parents or my Tennessee-based sisters. I guess I would challenge myself and others to ask yourself why before posting an image. I’ve been doing this a lot lately and found I take less photos with me in them, and more photos of what’s happening around me, hoping to spark a conversation and have a shared moment.